Noah Lyles becomes World Youth Olympic champ at 200 meters! Another World Youth Olympic champion for America! Myles Marshall (TX) wins boys 800 in 1:49.14! The World Youth Olympic Games are being held for track & field from Wednesday, August 20th through Tuesday, August 26th in Nanjing, China. Find updates below of the 16 Americans who will be competing over those 6 days. The first half of the competition is primarily qualifying rounds. Something unique abot the YOG is that everyone advances after the first round! There is a consolation finals for those athletes who did not make the "A" finals after the first qualifying round of their event. In his second opportunity to represent the United States this summer, Myles Marshall (Kingwood TX) made the most of the second chance to go for the glory. 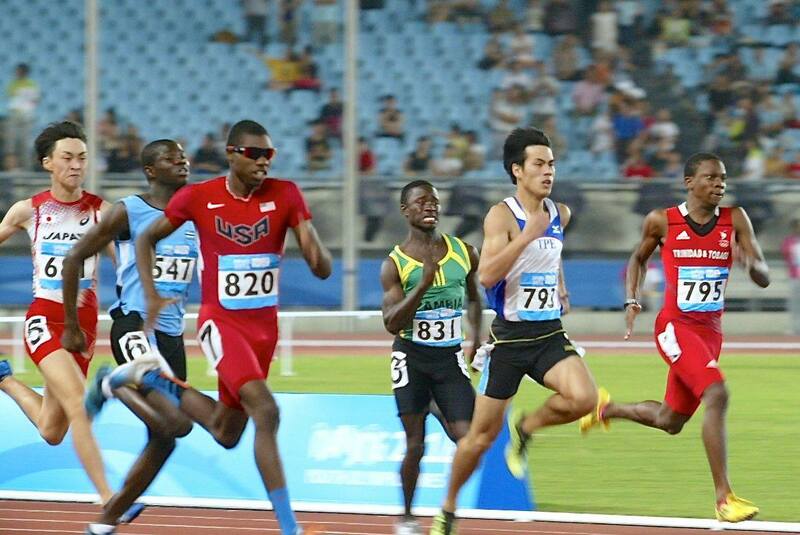 Marshall won the boys 800 meter finals to become a World Youth Olympic champion in a time of 1:49.14. 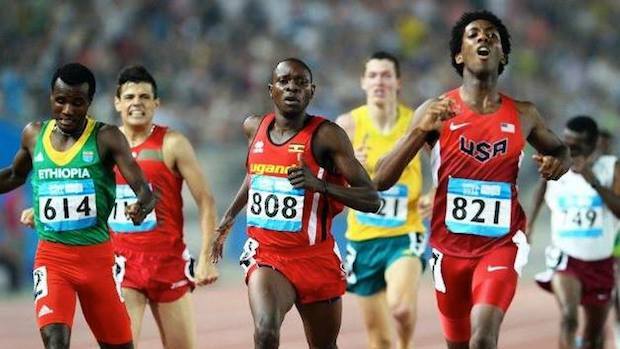 Marshall earned gold the hard way, leading from the front as he took the field through 54 seconds in the 400 and held off late challenges from competitors in Uganda and Ethiopia. Gold for Noah Lyles! The T.C. Williams (VA) rising junior Lyles became at World Youth Olympic champion in the boys 200 meter dash with a 20.80 victory in the finals on Sunday night in Nanjing, China. 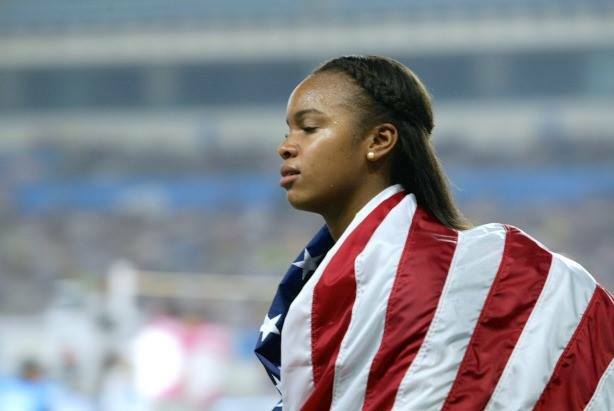 Lyles is the first gold medalist for the United States at the YOG. 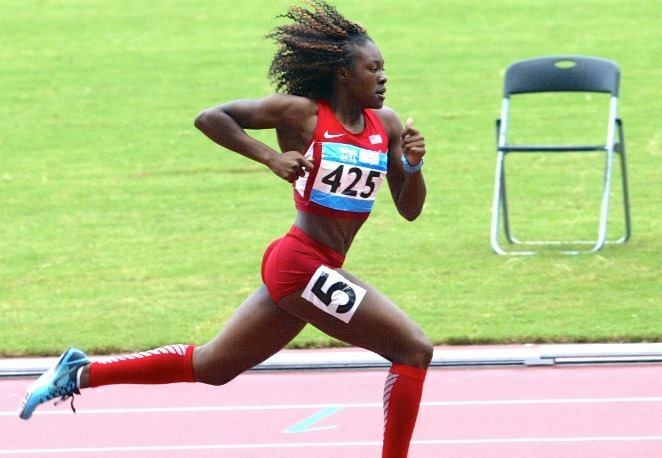 Nansemond River (VA) rising junior Brandee Johnson earned a bronze medal in the "A" finals of the girls 200 meter dash with a 24.28 clocking to pick up the second medal so far for the United States at the Youth Olympic Games. Kenneth Brinson (GA) finished 6th in the "B" finals of the boys hammer throw with his third attempt throw of 59.91m. In the girls long jump final, Rhesa Foster (CA) had a much better day than her prelims distance of 5.76m as she jumped 6.17m (20' 3'') to earn the bronze medal and win the United States its first medal of the Youth Olympic Games. After fouling her 2nd and 3rd attempts, Haley Showalter (CO) threw 45.12m in the girls discus finals to place 7th overall. After qualifying for the first final earlier in the week, Kimani Rushing of Hallandale (FL) had a slow start in her final resulting in an eighth place finish in her final and overall with a time of 14.07 in the 100m hurdles. Despite fouling two out of his four throws, Tyler Merkley's third attempt of 56.27 meters landed him 7th overall in the boys discus throw finals. Jeffrey Uzzell's (FL) slow prelim race kept him out of the 'A' final, but he won his consolation final in the 100 meter dash with a time of 11.04. Amere Lattin (TX) had a troublesome day with a slow finals finish of 15.53 getting 7th place in the boys 110 meter hurdles finals. Brittny Ellis (IL) entered the girls 400 meter dash 'A' final fourth overall from her 54.11 in the prelims. Although she ran faster than that in the finals (53.82), five girls ran faster and all ran personal bests leaving Ellis in 6th. 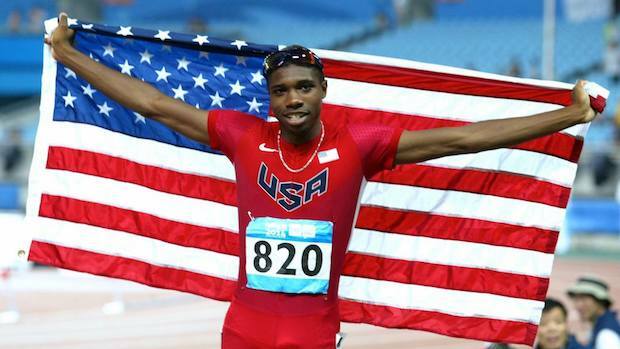 Noah Lyles came out on fire at the World Youth Olympic Games as the T.C. Williams (VA) rising junior started off his meet with a new all-time best clocking of 20.71 (wind-legal) as the fastest qualifier of all in the 200 meter dash prelims. Time ranks US #3 on the year among all wind-legal verified times behind only World Junior champs Trentavis Friday and Kendal Williams. Myles Marshall, who competed over 3 weeks ago for the United States at the World Junior Championships in Eugene, was back in action again for the red, white, & blue in the boys 800 meter prelims at the Youth Olympic Games as Marshall won his heat to move onto the finals with the fastest qualifying time at 1:50.22 from the Texas state champ at Kingwood High School. The state of Virginia was well represented in the girls 200 meter dash prelims as well by rising junior at Nansemond River High School in Brandee Johnson. Johnson posted the 4th fastest time among all qualifiers with a 24.41 clocking to place 2nd in her heat. Chinne Okoronkwo from Mountainlake Terrace High School in Washington, competed in the girls triple jump and finished 13th overall in the preliminary flights with a best mark of 12.03m, which converts to 39'5.50". Emma Fitzgerald of Thayer Academy in Massachusetts competed in the girls javelin qualifying round and had a personal best mark in China at 46.64m (153'00.25") to rank her 12th overall as she will move onto the consolation round. Janie O'Connor, a rising sophomore sprinter at Zachary High School in Louisiana, finished 4th in her 100 meter dash prelims heat with a time of 12.56 and ranks her 16th fast overall after the first round of competition. Jeffrey Uzzell similarly did not seem to get off to a quick start at the World Youth Olympic Games for the US as the sophomore at Eagles Landing Christian Academy in Georgia was well off his 10.50 PR with a 11.27 clocking in the boys 100 meter dash prelims to finish 6th in his heat. Indiana state champion high jumper and 2014 New Balance Nationals runner-up Janae Moffitt of Oak Hill High School cleared a height of 1.65m (5'5"), which ranks her 14th overall in the high jump qualifier round and will not advance her onto the "A" final. After qaulifying for the 'A' Final with a throw of 142' 4'' in the Discus, Haley Showalter finished 7th overall with a final throw of 45.12m (148' 3/8"). Amere Lattin of Fort Bend Marshall (TX) clocked a new PR of 13.53 in the boys 110 meter hurdles prelims to finish second his heat with the third fastest time overall. Brittny Ellis of Warren Township (IL) moves onto the semi-finals of the girls 400 meter dash after a second place finish in her prelims heat with a time of 54.11, which ranks 4th overall. Haley Showalter of Valor Christian (CO) threw for a mark of 43.39m (142'4") in the qualifying round of the girls discus throw, which ranks her 9th overall and gets her into the "A" finals. Kimani Rushing of Hallandale (FL) posted a new personal best clocking of 13.73 in the first round of the girls 100 meter hurdles, which will move her onto the next round as the 7th fastest qualifier. After fouling her first three attempts, Rhesa Foster of Clovis North (CA) finally got a legal mark in, which gets her into the finals of the long jump at 5.76m (18'10.75"). Tyler Merkley had only one legal throw in the boys' discus qualifying flight, but the one throw was good enough to make the finals (5th best overall) and actually a new personal best of 56.61m (185'8.75") for the Los Osos High School (CA) rising senior. Andrew James of Westminister Academy (FL), finished 4th in his boys 400 meter dash prelims heat with a time of 49.06, which ranked 13th fastest overall. James will not move onto the finals, but does move onto the next consolation round.